Common Cause in Wisconsin is holding the last of three town hall "public hearings" on judicial recusal tonight from 6:30PM to 8:00PM in the Grand Hall at Capitol Lakes - 333 West Main Street, Madison, WI. Wisconsin Supreme Court Justices Shirley Abrahamson and Ann Walsh Bradley will join former Dane County Circuit Court Judge Gerald Nichol as panelists. Nichol was the former Chair of the now-dissolved, nonpartisan Wisconsin Government Accountability Board. Wisconsinites would be shocked to know that our state is among the four worst in the nation with regard to the strength of recusal rules for judges receiving campaign contributions. Our current state recusal "non-standard" essentially states that justices may decide for themselves whether to recuse in a case involving a party who contributed to them. It was written verbatim by conservative special interest groups in 2010! This past April, the Wisconsin Supreme Court considered a petition by more than 50 retired Wisconsin judges to establish reasonable thresholds for recusal of judges at all levels when they receive campaign contributions from a defendant or plaintiff – or if they benefited from spending by an “outside” special interest group involved in a case before their court. Incredibly, the State Supreme Court voted 5 to 2 to reject this petition, and the Court did so without a single public hearing. With a Wisconsin Supreme Court election looming in early 2018 to replace retiring anti-recusal Supreme Court Justice Michael Gableman, it is critical that Wisconsinites fully understand and raise their voices about this issue – which will be prominent in that election. The Capital Times published this editorial on the importance of these events as well. Press coverage of the October 11th public hearing in Milwaukee is here. Attend this free event to learn more about this vital issue, to ask questions, and to share your thoughts. We hope you can attend, and bring a friend or two with you! Click here to RSVP. If you can't make it to Madison tonight, then join us online! We will be live streaming video of the event from Madison on our Facebook page here. You can also Tweet your questions to @CommonCauseWI on Twitter. Co-sponsoring this event with CC/WI are the the League of Women Voters of Wisconsin, the League of Women Voters of Dane County, The Madison Institute, and the American Association of University Women-Wisconsin. 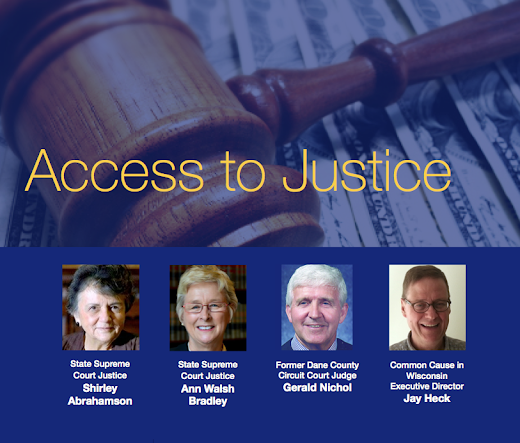 TONIGHT in Madison: Judicial Recusal "Public Hearing" with Justices Shirley Abrahamson & Ann Walsh BradleyTweet this!